NeMO Explorer allows you to explore the NeMO seafloor observatory at Axial Seamount either geographically or by subject matter. Visit one of six virtual sites for an animated tour with links to video clips. Or browse a collection of information on research at NeMO organized by concept with links to imagery and movies. To view the videos and animations in this web site you need the Quicktime plug-in. 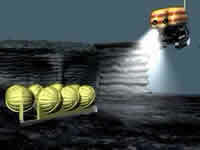 ROV ROPOS explores an instrument stuck in a new lava flow at the Rumbleometer Virtual Site. 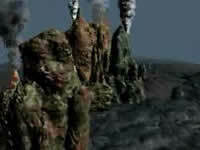 Fly through a hydrothermal vent field at the ASHES Virtual Site. Go to this page for direct links to all the animations, fly-through movies, videos, and panoramas on this site. This site is a finalist for the 6th Pirelli INTERNETional Award 2001, and was selected by the SciLinks program, a service of the National Science Teachers Association.